For the past couple of decades, there has been a drastic increase in the percentage of consumer furniture and goods manufactured using a material known as MDF. The average person probably isn’t familiar with the term, so it is understandable some of you might be asking, “What is MDF?”. Technically, MDF contains a mixture of wood solids, wax, and resin bonded together under high temperatures and high pressure to create a uniform wood-like product that is far cheaper than real wood. In simple terms, MDF is sawdust held together with glue, which ends up serving as the base for the furniture you get from office supply stores or certain shall-not-be-named furniture chains (Starts with an A and rhymes with rashly). This furniture made from MDF is believed to have a lifespan 1/10th of furniture made from solid wood. Sure the price is less but so is the quality. 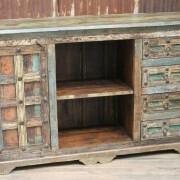 At Water Street Antiques & Interiors we only sell 100% solid wood… there is no “Man Made Wood” or MDF. The benefits of solid wood are a list a mile long however I will share a few of the top reasons. Solid wood simply lasts longer. 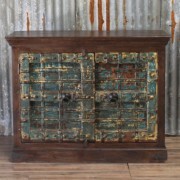 Think about ancient furnishings that are still around today. They are made from solid wood, not “man made wood”. One of the main reasons solid wood is so durable is its tolerance for refinishing. Solid wood items can be scratched beat up and dinged however with a few passes of the sander your piece looks as good as new. All of the benefits of solid wood lead to a higher initial price point. You pay for craft, you pay for superior materials, and you pay for durability. However, it is those same things that make solid wood a much better value. You do not buy solid wood furniture for a season. You buy it because it is going to last for many, many years. Veneers have their place, but it is solid wood that stands out for most people. Solid wood will last, the veneer & MDF piece simply will not. You can pay for a single, high-quality piece, or you can pay repeatedly for something of less quality. I hope this has helped educate you about different qualities of furniture…. Even if you do not buy from Water Street, make sure you know what you are buying… Make sure to buy quality and buy solid wood! For those of you who have chosen to purchase Water Street’s solid wood pieces…. Thank you!